To enter, please go here and complete the form! Feel free to email me at loranne@librarything.com if you have any further questions. I mentioned IT to the Friends of Daniel Boone Regional library during our search for library cast-offs. The volunteer was intrigued! Insurgent OR reach out to Friends groups. “and point us to them” – how do we do that? You can email me (loranne@librarything.com) a link or message me directly on LT here: https://www.librarything.com/profile/lorannen if you prefer! I’m just wondering why I keep seeing the “ad” for this t-shirt entry on my home page every time I log in to LT, when the deadline passed nearly two months ago. I missed it, and I have a great picture I wanted to post, too. So please, clear this off & quit rubbing in my disappointment. Sorry to hear our home page news post is bothering you. We left it up in order to encourage folks to continue to send in their photos. I’ve adjusted it to remove mention of the giveaway. 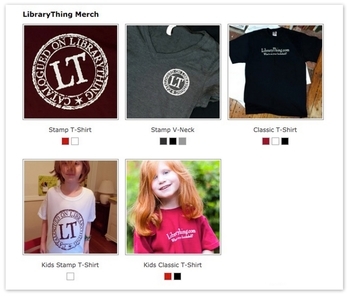 Please feel free to send your picture to me at loranne@librarything.com and I’ll be happy to add it to the gallery!